Snooki, from MTV’s Jersey Shore, claiming she is a victim of bullying. And Farrah Abraham, of MTV’s Teen Mom and a more recent famous video outing, also claiming that she was bullied. “I was bullied in high school and I’m beyond bullied as an adult on television, but I refuse to let anyone bring me down because all they talk is nonsense,” Snooki says in the article from Starcasm.net. OK, maybe you were bullied in high school, Snooki. Lots of people, myself included, had instances of this and it is a growing problem of national concern. However, you were offered a fabulous opportunity as an adult— an opportunity to make a lot of money to go on television and act like a drunken idiot. You performed this role with flying colors. This, after she slammed both Kim Kardashian and Charlie Sheen in recent weeks. The road runs both ways, my friend. Celebrities are celebrities because they are in the public eye. Both Snooki and Farrah Abraham signed up for fame. Whether they like it or not, once the public has a perception of you, we will form opinions. Because people have opinions of you that you might not agree with, does not constitute bullying. Snooki says she just wants to be a great mom, loving fiance and successful business woman. Well, go for it. 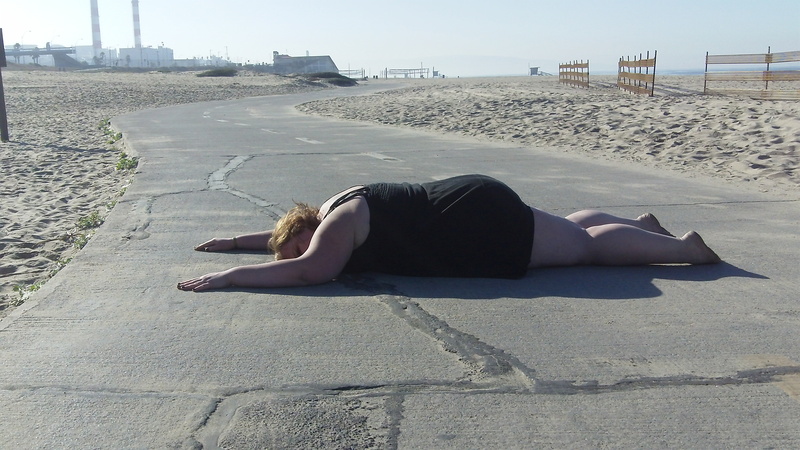 Put your nose to the ground and make your dream happen. You already have a leg up, called fame, that most of us do not. But please don’t go around crying that you’ve been bullied when we have real teenage victims of bullying hanging themselves in closets across the country. Facebook Fight Fridays! 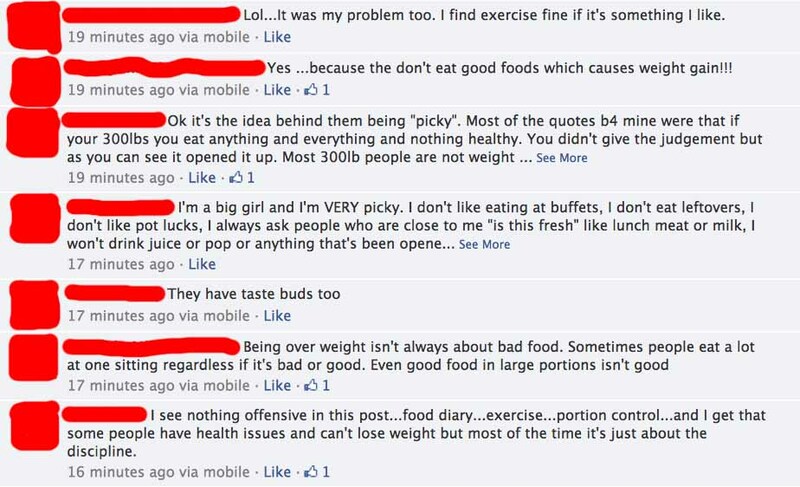 The Great Weight Debate! As you know if you come here often, one of my favorite hobbies is to take screenshots of Facebook posts and then offer them up for discussion. 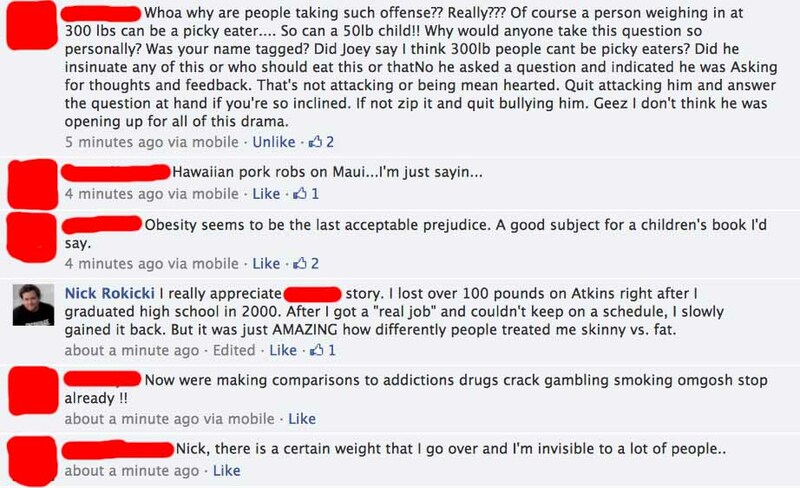 It’s Friday— and that means it’s time once again for Facebook Fight Fridays!!! Normally, I would just go ahead and use names in the above screen shots. After all, once it has been posted on a public forum like Facebook, isn’t it fair game? But this is a very sensitive subject. So I’ve redacted names and photos, except for Joe and myself. And one special guest, of course. Once Upon a Time… I cooked dinner for several people at my home. It wasn’t a “light” dish by any means— a pasta with cream sauce, wine, the whole nine yards. One of my friends, a larger person, brought a Little Caeser’s Hot-n-Ready Pizza to the dinner “just in case” she didn’t like what I was preparing. 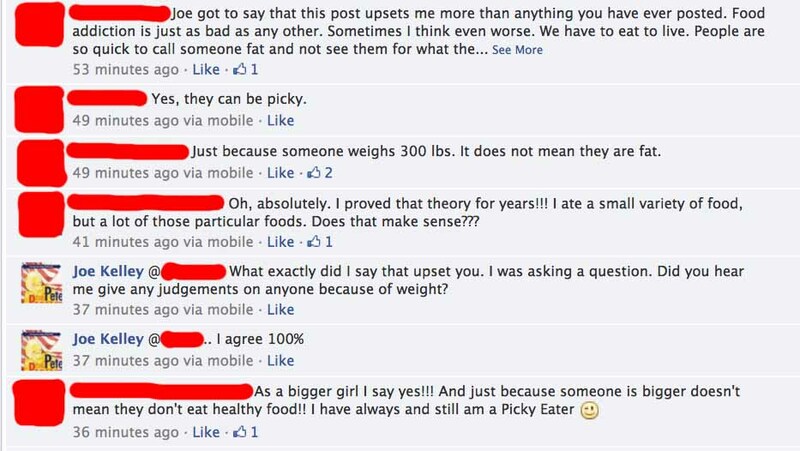 She said that she was a “picky eater” and might not enjoy my food. She ate some my food and a piece or two of her pizza. The End. Thus began the debate. 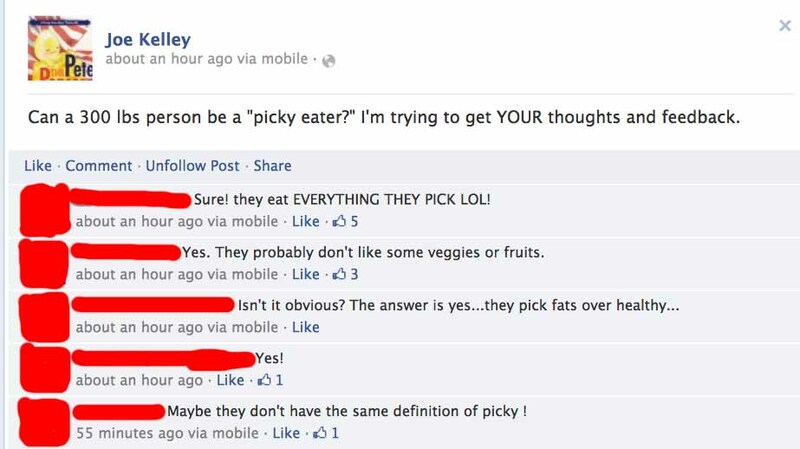 Can someone really be that damn picky? Or is this just rude, bad manners? Does weight have anything to do with it? Could this person have been 105 or 305 pounds and rude is rude is rude? Now, I’m no small bean myself. So I could absolutely see why some folks were getting mad. Like one person above referenced, there are many people that do eat healthy and their weight never changes. If they want to actually lose weight, exercise must be introduced. And then there are others that can literally shovel in anything they want and remain rail-thin— but are they healthy? You should have seen the snarls she was given by the bikers going by. 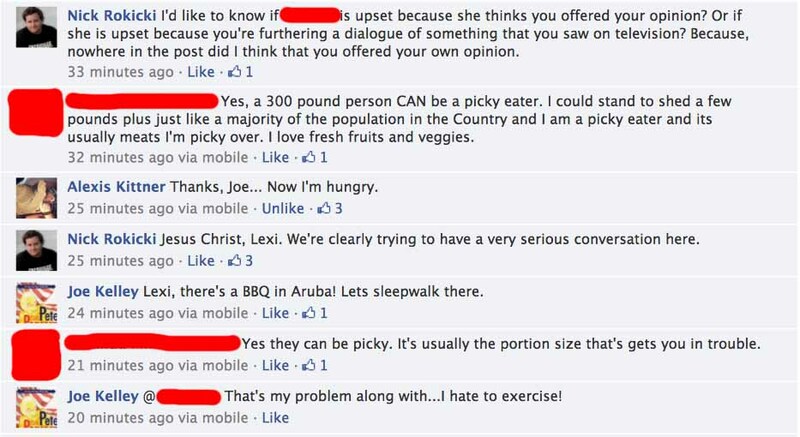 Anyway, back to the Great Weight Debate! Things got heated— quick. So you can see that people are coming to Joe’s defense. I really don’t believe that his initial question was offensive in any stretch of the imagination— because he didn’t give his own opinion. Now, I’m not vouching for the Rod Stewart-esque hair. But I looked damn good! And I felt even better! However, let me tell you this: I have never worked as hard in my life for something as that 100 pound weight loss. A lot of my progress had to do with a very rigid schedule that I had at the time: I would work from 9 AM to 3 PM. I would drive an hour to school. I would be in school from 5 PM t0 10 PM. Then I would drive home and go to the gym or run at midnight. I would sleep for 7 hours or so and then do it all over. This regimented, tight schedule helped me stay on track. This, along with a very low-carb diet and exercise, propelled me to great success with losing weight. But it was very difficult and something I worked on every single day. When I started working as a flight attendant in 2004, all bets were off. I didn’t have a schedule. I was in a different city every night. Barely access to a refrigerator. Layovers of 8 hours, sandwiched between 14 hour days– just enough time for sleep. No time for working out. On the rare occasion that I did have a nice layover in a unique city, what did the crew do? We went out for dinner and drinks! The calories added up because of the lifestyle. Were my experiences worth the weight that I gained and the hard work I flushed down the toilet? I don’t think so— but I can’t take back my choices, only attempt to correct them in the future. I agree with this poster. Food addiction is a real and serious thing. Have you ever tried to start a new diet or a new lifestyle? About three days into it, you’ll go through the same cravings and withdrawals that alcoholics and drug addicts go through, guaranteed. 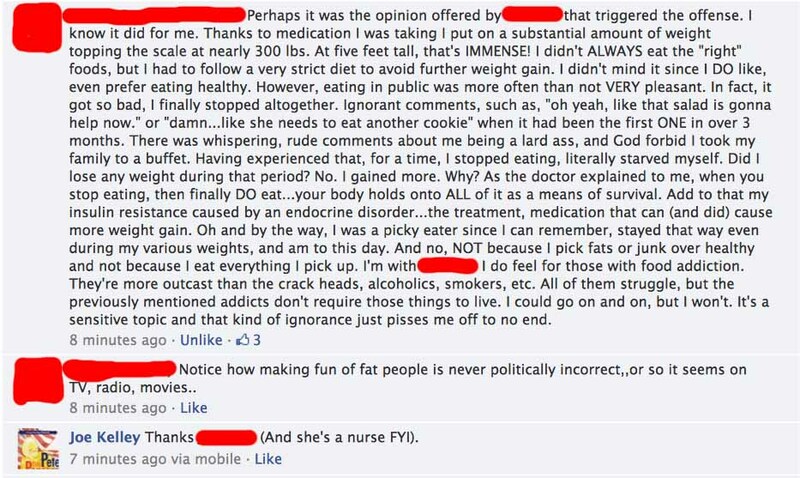 The poster above was referring to the fact that overweight people and “normal” people are treated very differently in this society— take it from me, who has seen both sides of the coin. In closing, the last two comments summed up the whole argument for me: the weight discussion needs to be treated as fairly, humanely and sensitively as any other in our national discourse, including race, religion or sexuality. What did I learn from this whole episode? 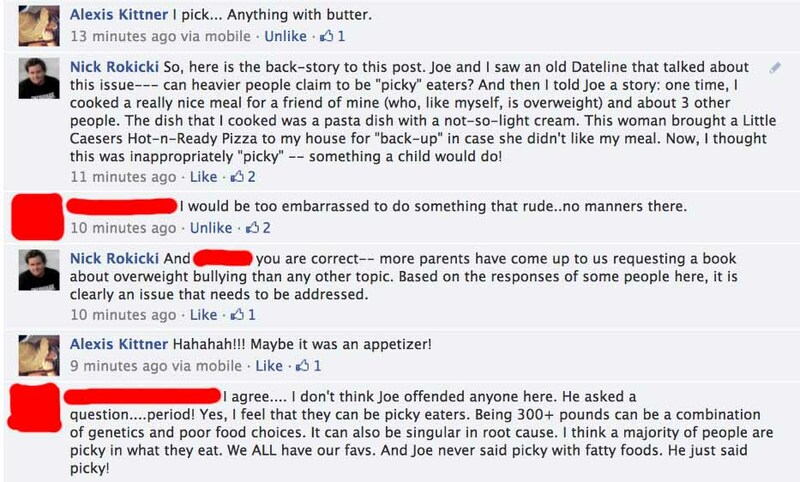 I should have separated “rudeness” from “pickiness” when discussing my friend and the “back-up” pizza. Because I’ve been through this myself, it should have occurred to me that any reference to a person’s size was going to stoke discussion that would grow heated and fierce. 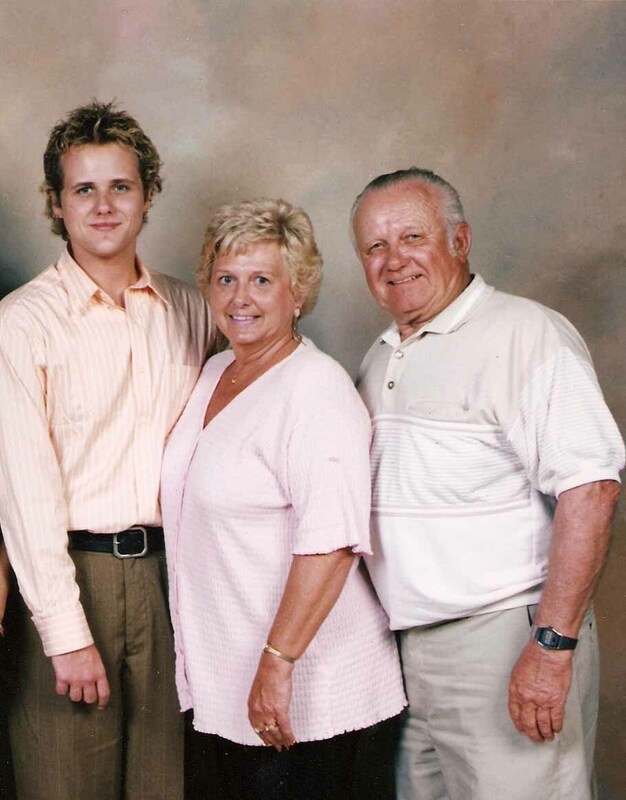 With this being said, many people needed to hear the personal stories that came forward because of the question Joe posed to his Facebook Family. Perhaps the next time they are willing to make a characterization about someone based on weight, they will be brought back to this discussion amongst friends and realize that we all have a story to tell.